Kathmandu (Nepal), Nov. 28 : A relatively moderate intensity earthquake measuring 5.6 on the Richter Scale shook Nepal in the early hours today. The epicenter of the earthquake is border of Ramechhap and Solukhumbu districts of Nepal, 131km from Kathmandu. There was no immediate report of any damage or casualty. This was the 475th aftershock, of magnitude four and above, of the devastating April 2015 temblor in the quake-prone Himalayan country. On April 25, 2015, the country was hit by a major earthquake measuring 7.8 on the Richter Scale. Kathmandu, Nov. 28 : Prime Minister Sushil Koirala has clarified that India has not put any pressure on Nepal's leaders to reach a consensus on creating a new Constitution. 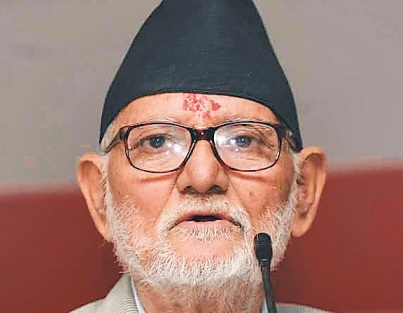 "As a neighbour, we need to take others' advice, but it's up to us to decide how to promulgate our Constitution," Kantipur Online quoted Koirala, as saying in response to a question posed to him during a press briefing on Thursday evening at the end of the 18th SAARC Summit. Prime Minister Modi had said on Tuesday evening that the parties should avoid polarisation in the Constitution drafting process and there should be a minimum consensus. Kathmandu, Nov 27 : The Ministry of External Affairs on Thursday said that there has been no proposal on the expansion of SAARC membership. "There has been no proposal on the expansion of SAARC membership. The proposal on table was to consider the observers as dialogue partners," said MEA official spokesperson Syed Akbaruddin. Talking about the energy pact, Akbaruddin said that it will enable all SAARC countries to trade in electricity. Kathmandu, Nov 26 : Prime Minister Narendra Modi on Wednesday met Sri Lanka President Mahinda Rajapaksa on the sidelines of the South Asian Association for Regional Cooperation (SAARC) Summit being held here. The two leaders discussed matters pertaining to the interest of both nations. 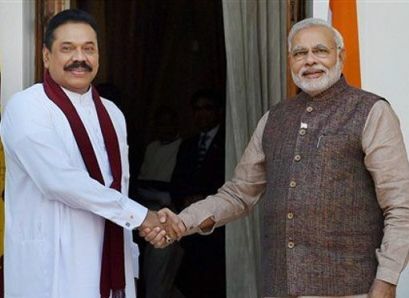 Prime Minister Modi also thanked President Rajapaksa after the latter's government released five Indian fishermen who had been incarcerated in a Sri Lankan prison and sentenced to death. Kathmandu, Nov 26 : Asserting that a prosperous SAARC needs the strong foundation of a secure South Asia, Prime Minister Narendra Modi on Wednesday urged all participating nations to work together to combat terrorism and trans-national crimes. "If we are sensitive to each other's security and the lives of our people, we will deepen friendships, spur cooperation and advance stability in our region," said Prime Minister Modi in his address at the SAARC Summit. Kathmandu: Prime Minister Narendra Modi on Sunday made an impromptu halt in a busy market in the heart of the Nepalese capital here during which he interacted with local people, just as he had done in Bhutan on his first foreign visit. Modi, the first Indian premier to visit Nepal in 17 years, was travelling to the Constituent Assembly after having talks with his Nepalese counterpart Sushil Koirala. Modi stopped his convoy and talked to the people before proceeding to the Constituent Assembly where he addressed the members. Kathmandu: External Affairs Minister Sushma Swaraj visited the famous Pashupatinath temple in the heart of Nepalese capital on Sunday. Swaraj, who is on a three-day visit to Nepal, was accorded a warm welcome at the temple. About 100 children chanted vedic mantras while senior priest welcomed her with garlands. She went around the temple and offered her prayers. Swaraj was accompanied by Foreign Secretary Sujatha Singh, Indian Ambassador to Nepal Ranjit Rae and other senior officials of her delegation. Kathmandu, July 26 : Visiting Indian External Affairs Minister Sushma Swaraj is reportedly busy holding parleys with leaders of various Nepalese political parties. After meeting Pashupati Shumsher Rana, the Chairman of the Rastriya Prajatantra Party (RPP) upon her arrival in Kathmandu on Friday, Swaraj started parleys with leaders of other political parties since early morning today, reports the ekantipur web site. She met the Chairman of Constituent Assembly, Subas Nembang, at Singha Dubar, while UCPN (Maoist) Chairman Pushpa Kamal Dahal called on her at the CA Hall in New Baneshwor. Kathmandu, July 25 : Indian External Affairs Minister Sushma Swaraj will arrive here on Friday afternoon on a three-day official visit to Nepal. She is visiting Nepal on the invitation Foreign Minister Mahendra Bahadur Pandey. Swaraj will head the Indian side in the Nepal-India Joint Commission Meeting on Saturday. Twenty-seven officers each from Nepal and India would participate in the commission's meeting. Kathmandu: Myanmar's democracy icon Aung San Suu Kyi today said despite the many challenges and problems democracy in Nepal confronts, she finds it inspiring as its spirit never wanes. The Myanmar opposition leader, on a four-day visit to Nepal, said development is the enhancement of the human spirit and that we should boost that spirit to progress. She also lauded the Nepal Army for its professionalism and asked the Myanmar Army to learn professionalism from their Nepalese counterparts. Kathmandu, May 24 : Indian private carrier Jet Airways has increased its frequency on the Kathmandu-Delhi sector by launching a third daily flight, the airline announced here. The carrier now operates three daily flights on the Kathmandu-Delhi sector effective Friday and two daily flights on the Kathmandu-Mumbai sector. Kathmandu is becoming an important market for Jet with ever growing number of migrant workers to the Gulf and other countries who use it for connecting flights to their destination countries. Kathmandu, Dec 26 : Bollywood star Aamir Khan-starrer action thriller "Dhoom: 3", which is expected to mint Rs. 300 crore (about $48 million), is going so strong at the box office in Nepal that the local filmmakers have had to delay the release of their own films for the next three weeks fearing tough competition. "We do not have Nepali movies to release now and for another two weeks, though five to six Nepali movies were ready to come out," Rajkumar Rai, chairman of Nepal Film Producers Association said. Many producers are not keen to release their films due to the overwhelming response to "Dhoom: 3", Rai told IANS. Kathman Sep 5 : The only billionaire in Nepal, Binod Chaudhary, also a member of the Communist Party of Nepal-Unified Marxist Leninist (CPN-UML), will contest the Nov 19 constituent assembly elections. The party said Chaudhary would join the fray from electoral constituency number 1 or 3 in Nawalparasi district of western Nepal, reports Xinhua. A final decision on the list of contenders, one each from those two constituencies, will be taken by the party shortly. Kathmandu, Aug 15 : Mahindra Reva Electric Vehicles (MREV) has launched Mahindra e20, a zero-emission electric car, in Nepal. The car, introduced as an urban mobility solution, is a fully-automatic car that comes with boost-mode system for rapid acceleration, said the company. The company said electric vehicles could be a solution for a sustainable 'zero-emission society'. It may also reduce environmental degradation, pollution-related health concerns, climate change, energy security and rising oil prices. Kathmandu, Aug 12 : The Nepal government and India's GMR Group will now go ahead to build the 900 MW Upper Karnali project in the western part of the country. Nepal's Supreme Court Sunday vacated a stay order, paving the way for further negotiations on a Power Development Agreement (PDA) between the two sides. Without the PDA, the project cannot move ahead. The Investment Board of Nepal (IBN), a government entity that facilitates mega projects including hydropower projects of 500 MW and above, will hold negotiations on the PDA with GMR Energy. New Delhi/Kathmandu, July 26 : United Progressive Alliance (UPA) chairperson Sonia Gandhi has stressed the need for "unity among Nepal's democratic forces". Gandhi, also Congress president, told visiting Nepali former prime minister and senior leader of the Communist Party of Nepal (Unified Marxist-Leninist) Madhav Kumar Nepal that her party and UPA favoured consolidation of democratic rights in the Himalayan nation with the drafting of the constitution and an early end to the ongoing political transition there. Nepal, who is on a five-day visit to India, called on Gandhi at her 10, Janpath residence in New Delhi Thursday. Kathmandu, July 5 : Indian External Affairs Minister Salman Khurshid will reach Nepal Monday on a two-day visit to extend support and solidarity to Nepal's elections process, it was announced here. Khurshid, whose visit comes on invitation of his Nepali counterpart Madhav Ghimire, will meet President Ram Baran Yadav, chairman of Interim Elections Council Khil Raj Regmi, Ghimire, and top leaders of major political parties, said Nepal's foreign ministry spokesman Arjun Bahadur Thapa. He will be accompanied by senior officials, he said. Kathmandu, June 20 : Dabur Nepal, a subsidiary of Dabur India, and the International Centre for Integrated Mountain Development (ICIMOD) here, have entered into a five-year partnership to promote medicinal and aromatic plants from the Hindu Kush Himalayan region. Experts from Dabur and ICIMOD will bring in their resources and experience to establish a herbal garden at ICIMOD Knowledge Park at Godavari, Kathmandu, according to a MoU signed by the two. The garden will facilitate research and development and act as a learning centre with demonstrations, hands-on training, and information sharing.